Trumbull’s Jack Ryan, in black, and Danbury’s Tyler Johnson, in white, wrestle in the 120-pound weight class on Jan. 16 at Trumbull High School. Many of the best teams in the region will be in Southington this weekend for the Connecticut Challenge, which begins at 9 a.m. Saturday. Defending New England champion Ponagansett (R.I.) won the event last year, just ahead of Bristol Eastern. 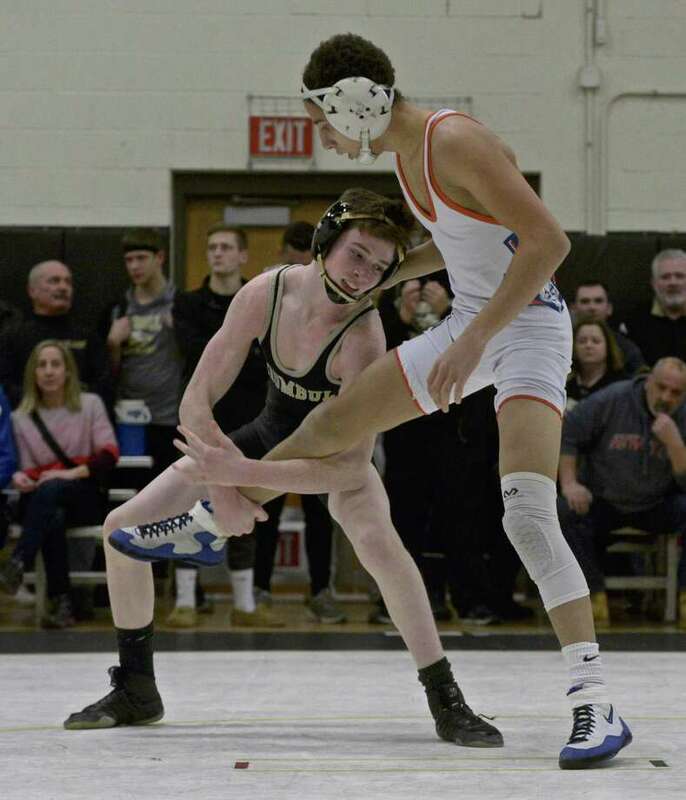 Trumbull and Simsbury will also attend the competitive meet that will feature matches that may occur again in the postseason. The day serves as one final test for many top grapplers before the fast-approaching championship season. Next Saturday marks the final set of invites before conference tournament time. “It’s a great tournament,” said Trumbull coach Charlie Anderson. “We’ll see Bristol Eastern and Simsbury for the third time; we haven’t seen Ponagansett but they’re a strong team. The Eagles have been busy this winter, posting a 21-5 record after a win over Ludlowe on Wednesday. Jack Ryan joined older brother Matt as 100-match winners during the meet. Trumbull has several aces up its sleeve — including Wilton transfer Travis Longo — as it hopes to improve upon last year’s fourth-place finish at FCIACs. The Blue Knights are up to No. 3 in the state while Trumbull sits at No. 8. Simsbury is No. 5 and will likely have a final say in who wins the tournament. Danbury continues to sit atop the CTwrestling.com Top 10 Poll as a unanimous No. 1, and delivered its most impressive performance to date on Monday. The Hatters crushed Mount Anthony 49-22 in a dual meet in Bennington, Vermont. The visitors had lost to Mount Anthony in 2018 and turned it around with their biggest win in the 20-year series. It was a new experience for the younger wrestlers, coach Ricky Shook said. After this weekend’s quad meet at Timberlane (N.H), the Hatters visit Stamford (Jan. 30) and close the regular season at home against Greenwich (Feb. 5). The FCIAC tournament will take place the weekend of Feb. 8-9. The Colter-Abely Midseason Classic at Mercy High brought the best out of No. 2 Bristol Eastern, which won the competitive tournament last Saturday to cement its status as the second-best team in the state heading down the stretch. The Lancers won three individual titles — Sophomore Thomas Nichols (132), and seniors Justin Marshall (152) and Trinidad Gonzalez (220) — to help Eastern to 166 points, ahead of Xavier (151.5) and Trumbull (150.5). Eastern also had a pair of finalists and third-place finishers. Eastern wasn’t the only school to win three championships as both Xavier and Trumbull accomplished the feat. The Eagles tandem of Travis Longo (113), Matt Ryan (138) and Joe Palmieri (182) took home titles while Mikey Rapuano (106), James Lunt (145) and Dylan Souza (170) did the same for Xavier. Danbury, Xavier, Nashoba (Mass.) at Timberlane: Hatters and Falcons participate in a quad meet against one of New England’s best. Foran at East Haven, Tuesday, 6:30 p.m.: Two of SCC’s best square off here. New Milford at Newtown, Wednesday, 7 p.m.: Arguably the two best teams in the SWC meet up on the eve of the postseason; Green Wave have won the last three championships. Simsbury at Southington, Wednesday, 6 p.m.: No. 3 meets No. 5 in what should be one of the meets of the season.